You see in Russia, I many issues with food items (names & procedures)! I am a certified Chef, so I have learned a whole different world of cooking than what I see in Russia! Pancakes: A type of flat bread prepared from a sweet batter that is cooked on a hot griddle or in a frying pan. They exist in several variations in many different local cuisines. Most pancakes are quick breads, although some are also made using a yeast-raised or fermented batter. Pancakes are many times served with Butter & Maple Syrup! Crêpe: (pronounced /ˈkreɪp/, French IPA: [kʀɛp]) is a type of very thin cooked pancake usually made from wheat flour. The word, like the pancake itself, is of French origin, deriving from the Latin crispa, meaning “curled”. 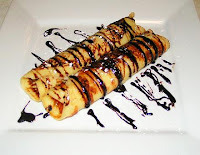 Crêpe are served many times with fillings such as whipped cream and jellies, then rolled up. European pancake: called Pfannkuchen or Eierpfannkuchen in German, Palatschinken in Austrian, palacsinta in Hungarian, clătită in Romanian, palačinke in Slovenian, Serbian, Croatian and Bosnian, is thin and comparable to the French crêpe. Unlike thick American pancakes, it is filled with different types of food and can be eaten for lunch or dinner. What does Russia have in place of Pancakes? Russia has Blini! What is this Blini you keep talking about? What is the definition of a blini, and what origin are they? Blini are small, yeast-leavened, buckwheat pancakes that originally come from Russia. Classically they are served with sour cream, cottage cheese & caviar or smoked salmon. Blinis had a somewhat ritual significance for early Slavic peoples in pre-Christian times since they were a symbol of the sun, due to their round form. They were traditionally prepared at the end of the winter to honor the rebirth of the new sun (Pancake week, or Maslenitsa). This tradition on was adopted by the Orthodox church and is carried on to the present day. 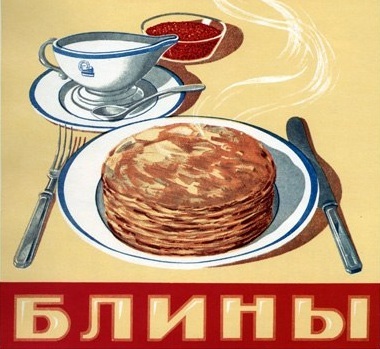 Blini were once also served at wakes, to commemorate the recently deceased. Traditional Russian blini are made with yeast batter, which is left to rise and then diluted with cold or boiling (zavarnye blini) water or milk just before baking them in the traditional Russian oven (to this day the process of cooking blini is referred to as baking in Russian, even though these days they are almost universally pan-fried, like pancakes). By Russian tradition the first blini is always destroyed while frying. 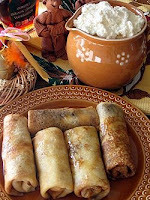 Blintzes (blinchiki in Russian, considered to be a borrowed dish) are made from unyeast batter (usually made of flour, milk and eggs) and are nearly identical to French crêpes. All kinds of flour may be used for making blini: from wheat and buckwheat to oatmeal and millet, although wheat is currently by far the most popular. What does this have to do with Maslenitsa? 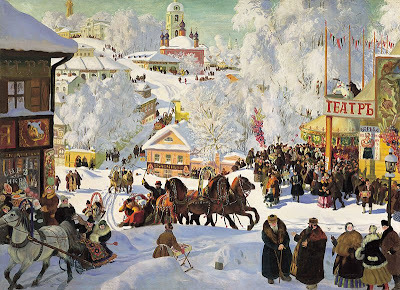 PS You want to know more about Maslenitsa? Watch the video!